The glass plate can be set to automatically open after each scan, making high volume scanning easier on the operator.Image Access scanners have been tested and proven compliant with international standards. Certification and compliance declarations can be seen on the model type label on the back of the deviceUsing the programmable book cradle, the pressure of the book to the glass plate can also be programmed, always ensuring the proper amount of pressure regardless of where in the book you are scanning.Clearance for artwork is adjustable for heights between 100mm / 4" and 200mm / 8" and is completely controllable by the operator via touchscreen.The WideTEK® 36ART enables contact free scanning of works of art like oil and acrylic paintings, watercolors, charcoal and pastel drawings, mixed media collages and antique works of art - at 600dpi in formats up to 914 x 1524mm / 36 x 60 inches.The WideTEK® 36ART features a large full HD touchscreen for easy operation. 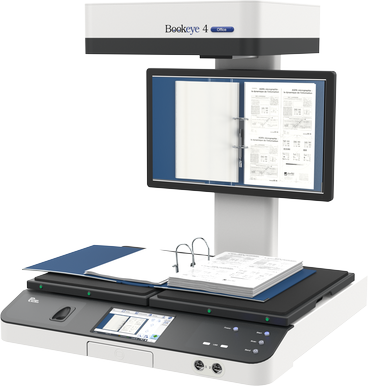 The configurable user interface allows a simple and comfortable control of the scanner.The frontal visual control window enables the operator to monitor the scanning process at any time.The new and unique background drum does not touch the glass plate at any time, avoiding scratches and document skews. To achieve extra contrast on sepias and film based documents, the standard black drum can be exchanged with a white drum, without needing any tools.The new WT25-BACKLIGHT option is built for scanning transparent material of all kinds, like X-rays, glass negatives, 35mm microfilm aperture cards, cutout stencils, sepias and film. The backlight unit replaces the standard scanner lid and is easily assembled. Bundles offer maximum value at a very attractive price. All bundles come with two years limited warranty plus one year of our Full Coverage Warranty. Each bundle is targeted for a special application but can also be upgraded to another bundle with the purchase of a few options. All bundles include software and a built in PC, no external equipment needed. WideTEK 36 Wide Format Scanner 36" (915mm) Bundle includes 36 inch floorstand, WideTEK external 22" monitor with arm, background drum for WT36-600, white (for transparent documents), foot switch, Batch Scan Wizard batch scanning software and Full Coverage Warranty covering hardware and software for 12 months.WideTEK 36C Wide Format Scanner 36" (915mm) Bundle includes 36 inch floorstand, WideTEK external 22" monitor with arm, foot switch, Batch Scan Wizard, Batch Scanning Software and Full Coverage Warranty covering hardware and software for 12 months.WideTEK 44 Wide Format Scanner 44" (1118mm) Bundle includes 48 inch floorstand, WideTEK external 22" monitor with arm, background drum for WT44-600, white (for transparent documents), foot switch, Batch Scan Wizard batch scanning software and Full Coverage Warranty covering hardware and software for 12 months.WideTEK 48 Wide Format Scanner 48" (1220mm) Bundle includes 48 inch floorstand, WideTEK external 22" monitor with arm, background drum for WT48-600, white (for transparent documents), foot switch, Batch Scan Wizard batch scanning software and Full Coverage Warranty covering hardware and software for 12 months.WideTEK 48C Wide Format Scanner 48" (1220mm) Bundle includes 48 inch floorstand, WideTEK external 22" monitor with arm, foot switch, Batch Scan Wizard, Batch Scanning Software and Full Coverage Warranty covering hardware and software for 12 months.WideTEK 36 Wide Format Scanner 36" (915mm) Repro Bundle includes 36 inch Universal Multi Function Stand to be used with most printers, up to 60 inches high. Also includes large color monitor, background drum for WT36-600, white (for transparent documents), foot switch, Batch Scan Wizard batch scanning software and Full Coverage Warranty covering hardware and software for 12 months.WideTEK 36C Wide Format Scanner 36" (915mm) Repro Bundle includes 36 inch Universal Multi Function Stand to be used with most printers, up to 60 inches high. Also includes large color monitor, foot switch, Batch Scan Wizard Batch Scanning Software and Full Coverage Warranty covering hardware and software for 12 months.WideTEK 44 Wide Format Scanner 44" (1118mm) Repro Bundle includes 36 inch Universal Multi Function Stand to be used with most printers up to 60 inches high. Also includes large color monitor, background drum for WT44-600, white (for transparent documents), foot switch, Batch Scan Wizard batch scanning software and Full Coverage Warranty covering hardware and software for 12 months.WideTEK 48 Wide Format Scanner 48" (1220mm) Repro Bundle includes 48 inch Universal Multi Function Stand to be used with most printers, up to 60 inches high. Also includes large color monitor, background drum for WT48-600, white (for transparent documents), foot switch, Batch Scan Wizard batch scanning software and Full Coverage Warranty covering hardware and software for 12 months.WideTEK 48C Wide Format Scanner 48" (1220mm) Repro Bundle includes 48 inch Universal Multi Function Stand to be used with most printers up to 60 inches high. Also includes large color monitor, foot switch, Batch Scan Wizard Batch Scanning Software and Full Coverage Warranty covering hardware and software for 12 months. The MFP bundle includes PrintWizard, the Image Control Center for scanning, printing and folding with all machines fully integrated and offers support for Canon iPF, iPF Pro Series, ColorWave and PlotWave, HP DesignJet and PageWide and other printers. Ultra high resolution scanner camera with no Bayer artifacts, not a digicam substitute. Compares to extremely expensive 200MP digital/matrix cameras.Ultra high resolution wide gamut CCD cameras produce up to 600dpi brilliant scans. The cameras are housed in a sealed, dust proof container and need no mechanical adjustment over their lifetime. The color output, including ICC profiling, is done in native, sRGB or Adobe RGB modes. Dual light CIS modules eliminate folds and wrinkles in the scanned images. The scanner produces extraordinarily sharp images, with color accuracy even superior to competing CCD scanners. The design of the scanner is not only elegant and pleasing to the eye but also ergonomic. All operational controls, connectors and buttons are placed exactly where they are convenient to the user.Attached to the back wall of the scanner, the magnetic document return guides send the scanned document back over the top of the scanner to make feeding the next document a more ergonomic process for the operator. The guides are adjustable for optimal placement based on the width of the batch of documents being scanned, further increasing production speed.Fingerprint authentication enables job storage and management as well as security in an office environment.Easy to find room for! The device has a very small footprint, which is only slightly bigger than the maxiumum scanning area.Scanning about 20% more than A3 in size, the device fits in nearly any environment due to its very small footprint.Scanning more than A2 in size, the device fits in nearly any environment due to its very small footprint.Scanning 915 mm (36 inch) widths and nearly unlimited lengths, this compact device still has a very small footprint with its dimensions of 220 x 1094 x 555 mm (8.7 x 43 x 21.9 inch).Scanning 965 mm (38 inch) width and lengths up to than 65m (200ft), the device still has a very small footprint with its dimensions of 1100 x 410 mm (43.3 x 16.1 inch).Scanning 1118 mm (44 inch) widths and nearly unlimited lengths, this compact device still has a very small footprint with its dimensions of 228 x 1425 x 507 mm (9 x 56.1 x 20 inch).Scanning 1270 mm (50 inch) widths and nearly unlimited lengths, this compact device still has a very small footprint with its dimensions of 228 x 1425 x 507 mm (9 x 56.1 x 20 inch).Scanning 1270 mm (50 inch) width and lengths up to than 65m (200ft), the device still has a very small footprint with its dimensions of 1430 x 410 mm (56.3 x 16.1 inch).Scanning 40% more than DIN/ISO A3 the device still fits in nearly any environment due to its tiny footprint.The glass plate is ideal for scanning in flat mode with very thick books. The glass plate applies the ideal amount of pressure to the source material without damaging it, assisting in flattening the curve of the book fold. Documents scanned can be returned over the top of the scanner eliminating the need to constantly bend over to pick up scanned originals.The user can connect an external touchscreen or other monitor via HDMI. The monitor can be used for image control or to modify the scan parameters, without a client PC. Two bars, each containing bright white LEDs, provide always ready illumination for excellent scan results. The LEDs are IR/UV free and need no warm up time. The automatic motorized book cradle with up to 10 cm height adjustment is programmable for the thickness of a book. Set it once and scan the book without having to constantly control the position of each cradle and the pressure on the book to the glass plate.The automatic motorized book cradle with up to 35 cm height adjustment is programmable for the thickness of a book. Set it once and scan the book without having to constantly control the position of each cradle and the pressure on the book to the glass plate.Powerful and high quality MFP system to scan, copy and archive documents at high speed together with the Canon TX-3/4000 printers. Brilliant imaging at the lowest possible price.The integrated stand, designed specifically to neatly fit the contour of the Canon TX-3/40000 printers, is easily and quickly attached with two screws. Only 13 parts, no technician required.Powerful and high quality MFP system to copy to any Canon wide format printer, scan to any network resource and make the WideTEK 36CL-MF the center of all document input activities.Select media type, printing quality and more as well as watch the ink levels through the 100% integration of the printer´s functionality in ScanWizard.Powerful and high quality MFP system to scan, copy and archive documents at high speed together with the HP DesignJet and PageWide series of printers.Select media type, printing quality and more & watch ink levels in ScanWizard via 22 inch external touchscreen with arm mounted to the scanner.Pad holder for a secure place to put your iPad, Android tablet or smartphone when operating the scanner using the mobile scanning application Scan2Pad®The adjustable and removable paper catch adapts to all kinds of different documents.The paper guide consists of only one piece which includes the scanning bed, scanning area and the exit path. There are no edges or catches which could cause a paper jam. If necessary, the entire paper guide can be removed by unscrewing a few easily accessible screws, allowing full access to the transport drums and the background drums. Image Access scanners are a truly green scanners. The power supply is CEC level VI compliant, the lowest power consumption level and highest efficiency level existing today. Its power consumption in sleep mode is only 0.5W. It operates on any mains voltage in the world, from 100-240 V AC, 47 - 63 Hz. During scanning, the power consumption varies but is always less than 150W. Its power consumption in sleep mode is only 0.5W. It operates on any mains voltage in the world, from 100-240 V AC, 47 - 63 Hz. During scanning, the power consumption varies but is always less than 55W. Two easily removable paper guides allow center feed, left- or right-aligned scanning. Three "paper present" sensors start the feeding process. The automatic size and position detection always produces aligned and cropped images of the document regardless of how it was fed to the scanner. When the paper guides are removed, the document transport width is increased to 38".Two easily removable paper guides allow center feed, left- or right-aligned scanning. Three "paper present" sensors start the feeding process. The automatic size and position detection always produces aligned and cropped images of the document regardless of how it was fed to the scanner. When the paper guides are removed, the document transport width is increased to 50".The Scan2Net® technology is the underlying technological platform for controlling Scan2Net® devices. All parameters are available in a clearly structured interface. Minimized scan time combined with multipurpose data output increases the efficiency of document scanning. Audio output makes the scanner easy to operate and simplifies troubleshooting in case an error arises. The audio cues are available in multiple languages, offered in the Scan2Net® interface in your browser or on the touchscreen. In addition, there are non-verbal audio cues to confirm various touchscreen selections. Four small start buttons along the front edge of the scanning bed allow you to start a scan even when holding down the pages of a book. The 7 inch color WVGA (wide VGA) touchscreen provides access to all functions directly from the scanner. It is very easy to access and is operator-friendly because it is located right at the center of the scanner, exactly where the operator stands or sits. ScanWizard Touch, the integrated software developed specifically for use with an external touchscreen, enables easy, comfortable operation with a large 22" touchscreen. Placement of the touchscreen is flexible – either on or next to the scanner.Two USB connectors at the front of the device make it easy to walk up to the scanner, plug in a USB storage device, scan your source document and walk away - without the need for a connected PC - ideal for every self-service environment. Two USB connectors at the front of the device make it easy to walk up to the scanner, plug in a USB storage device, scan your source document and walk away - without the need for a connected PC - ideal for every self-service environment. One USB connector at the front of the device make it easy to walk up to the scanner, plug in a USB storage device, scan your source document at lightening speeds of up to 400MBytes/s and walk away - without the need for a connected PC - ideal for every self-service environment. One USB 3.0 port at the front of the device makes it easy to walk up to the scanner, plug in a USB storage device, scan your source document and walk away - without the need for a connected PC - ideal for every self-service environment. The 22" monitor allows instant previews. All scanners come with a virtual rescan functionality which allows changing almost any scanning parameter on-the-fly before finalizing scans. This makes the scanner a fully standalone solution without the need for a client PC.The 27" monitor allows instant previews. All scanners come with a virtual rescan functionality which allows changing almost any scanning parameter on-the-fly before finalizing scans. 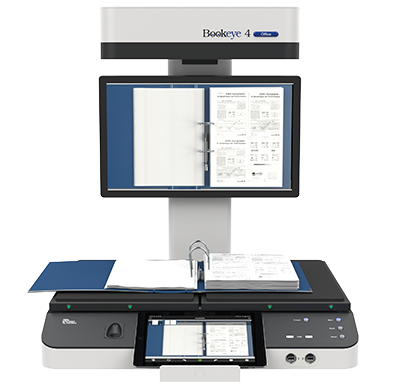 This makes the scanner a fully standalone solution without the need for a client PC.A monitor directly connected to the scanner can be used for image control or to modify the scan parameters, without a client PC.The V-shaped book cradle enables distortion free scans while it also protects the book binding. The balanced design allows effortless scanning without any physical effort. For exact positioning on the book fold, the V-shaped glass plate is moved horizontally. If required, it can be removed without requiring any tools or special technical training. Special transport rollers that ensure safe and skew free paper transport. For historical and fragile documents, this is critical.Two rows of high quality white LEDs, together with a special diffuser, produce a very homogenous light which makes all folds and wrinkles invisible. It also has no UV or IR content which could harm originals. LEDs are instant on and are only switched on during scanning time, extending their useful lifetime to typically more than 5 years. The local WiFi access point built in to the scanner allows mobile scanner operation and storage of images via Scan2Pad®The new scratch resistant, non-reflective glass plate has been expanded to reach the edges of the scanner, making it 100% protective of the documents laid on it. No more bent or folded edges on your source documents. This scanner exceeds all criteria set forth in the FADGI ** guidelines and ISO 19264-1 level B.